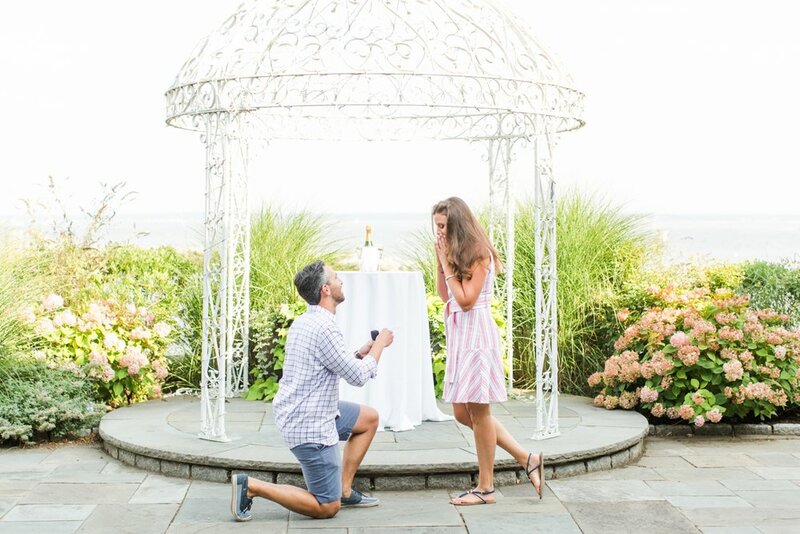 After planning an intricate proposal, Rob asked Kara to marry him at the Mamaroneck Beach and Yacht Club with stunning views of the harbor behind them! When Rob reached out looking for a photographer to capture his marriage proposal to Kara, I knew it was going to be a fantastic day! After the two of us finalized the details of how everything was going to happen, Rob told Kara that they were going to grab drinks at the bar of one of the yacht clubs in Westchester. As the two walked onto the back patio, the song Just The Way You Are by Bruno Mars was playing softly in the background. Kara was a little confused because as far as she knew they were going to enjoy some cocktails along the water, and there wasn't a bar on the patio in sight! Rob took her hand walked over to the pergola, and she immediately realized what was happening. He got down on one knee, and asked Kara to be his wife! After celebrating and toasting each other with some champagne, I photographed Rob and Kara for a mini engagement session along the patio with stunning views of the water. Congratulations Kara and Rob! Cheers to many happy years ahead! Kara's reaction was absolutely priceless! Look at that stunning engagement ring! When Kara saw it, she mentioned to Rob that it was the exact style she'd always dreamed of! I hope you enjoyed this Mamaroneck Beach and Yacht Club wedding proposal! Do you know Kara and Rob? Show them some love by commenting below!